Never strapped skates on before? Love to skate but have never tried roller derby? 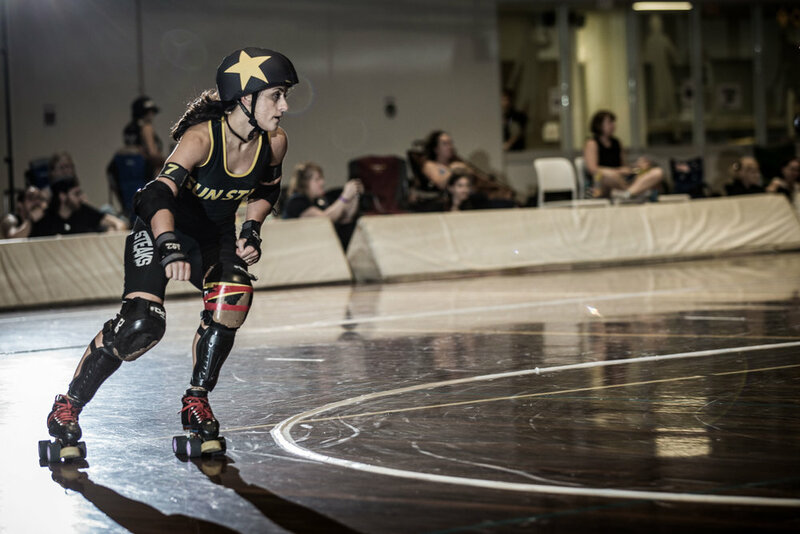 Sun State has a world-class training program that will teach you the skills you will need to play roller derby. Whatever your starting ability; whether your aim is to play recreationally or competitively - you can progress at your own pace, in a safe and supportive environment. Come along to one of our info sessions to find out more about the sport and the league. Regular info sessions are advertised on Sun State's Facebook page. You'll also be provided with details about our next On-Skates Session. Don’t worry if you’re an absolute beginner, we can hold your hand and teach you what you need to know. It’s as easy as that to start your roller derby journey with Sun State. Questions? Scroll down to our FAQ. Whether you’ve played roller derby before and had some time away, or are a current skater and like the sound of Sun State's culture, we’d love to have you on board. We recommend you drop into one of our info sessions - you can make sure that Sun State is the right league for you, ask us questions, and we can discuss next steps with you. Regular info sessions are advertised on Sun State's Facebook page. Alternatively, get in touch with us via email or our Facebook page. I want to play roller derby, but I've never skated before. You don't have to be a great skater to come along. We'll teach you the basics, and build from there. Sun State is an adult roller derby league - you must be 18 years old to join. Sun State welcomes skaters at all levels of fitness and ability. Roller derby is a unique sport in that there is no typical body type. Skaters of all shapes and sizes are skilled and valued contributors to their team. Training for roller derby will improve your fitness and confidence, no matter your starting point. Any additional health and fitness activities you undertake outside roller derby can complement and support your skating. In order to skate at your first session, you will need access to quad skates and full safety gear - helmet, knee pads, elbow pads, wrist guards, mouthguard. While we recognise that the initial outlay for equipment can be expensive, especially when you're starting out - safety is non-negotiable and you cannot skate without the above. Ask your local skate store about Fresh Meat packs - they include all the gear you need, and are an economical way to get started. A small amount of second-hand safety gear is available on loan for on-skate sessions, but this is limited and never guaranteed. Yes. Temporary insurance will be arranged at your signup to cover the initial program. Once you're a full Sun State member, ongoing insurance is purchased through the league. I'm keen, How do I get started? Look for our next info session on Sun State's Facebook page.